Od początku kryzysu, CNT broniło strajku generalnego, jako najlepszej broni klasy pracującej przeciwko atakom ze strony banków i szefów. Odrzucamy proces negocjacyjny w którym związki zawodowe wezwały rząd do spowolnienia reform prawa pracy po strajku generalnym z 29 marca. W ten sam sposób odrzuciliśmy tzw. „szczyt społeczny”, który wzywał do usunięcia najbardziej rażących nadużyć rządu PP, jednak zachowując podstawy systemu politycznego, który doprowadził do sytuacji, w której się znajdujemy. Odrzucamy też sposób, w jaki próbuje się opóźnić i zepchnąć na niewłaściwy tor reakcje społeczeństwa, za pomocą bezużytecznych propozycji, takich jak wniosek o referendum. Trudna sytuacja społeczna w której się znajdujemy wymaga mocnej odpowiedzi. Odpowiedzi, która nie poprzestanie na jednorazowym działaniu, ale będzie długoterminowa. Musimy być gotowi zerwać więzy z politycznym i ekonomicznym systemem, który stanowi źródło problemu. 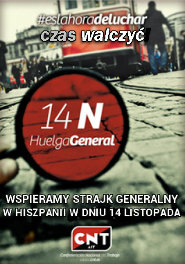 Po wahaniach, które trwały miesiącami, CCOO i UGT wezwały w końcu do strajku generalnego w dniu 14 listopada. Zostały do tego zmuszone z jednej strony przez rosnące niepokoje społeczne i mobilizacje uliczne, a z drugiej strony przez nasilające się antypracownicze działania rządu, realizowane w interesie elit finansowych i pracodawców. Rząd nie ma nawet zamiaru zostawić okruchów, które pozwalają instytucjonalnym związkom zawodowym usprawiedliwić swoje istnienie. CNT zgodziło się na udział w strajku generalnym w dniu 14 listopada, jednak weźmiemy udział na naszych własnych zasadach, z naszymi własnymi żądaniami. Uznajemy ten strajk za konieczny, ale nie wystarczający. Musimy wykroczyć poza sterylny i frustrujący scenariusz serwowany nam przez instytucjonalne związki zawodowe, do których ludzie się przyzwyczaili. Il 14 novembre la CNT convoca lo sciopero generale contro la riforma del lavoro e i tagli allo stato sociale. Fin dall’inizio della crisi finanziaria ed economica internazionale, la CNT ha proposto lo sciopero generale come strumento principale della classe operaia contro gli attacchi del sistema bancario e di gestione finanziaria mondiale, rifiutando ogni proposta di negoziazione con il governo formulata dal sindacalismo “governativo” finalizzata a facilitare la riforma del lavoro – in senso restrittivo – dopo lo sciopero generale di 29 marzo scorso. Coerentemente a questa impostazione tattica noi abbiamo rifiutato gli approcci di tipo verticistico finalizzati a rimuovere solo gli eccessi sociali più eclatanti del governo guidato dal Partito Popolare, mantenendo inalterata la cornice del sistema economico e politico che ci ha messo in questa situazione: emblematico, in questo contesto, il tentativo del sindacalismo “governativo” di allentare la tensione sociale con proposte dilatorie e inutili come il referendum. La difficile situazione sociale, infatti, richiede una risposta forte che punti a crescere di intensità e sia finalizzata a rompere i legami con il quadro politico ed economico che ha originato tale sconquasso sociale e che – in ultima analisi – è il principale complice e beneficiario di questa situazione. Read more about Il 14 novembre la CNT convoca lo sciopero generale contro la riforma del lavoro e i tagli allo stato sociale. Since the beginning of the economic crisis, the CNT has defended the general strike as the main tool of the working class against the attacks carried out by the banks and the bosses. We reject the negotiation where the unions called on the government to ease the labour reform after the general strike of March 29. In the same way we have rejected the approach of the so-called social summit, to eliminate only the most flagrant excesses of the PP government, maintaining the core of the economic and political system that has put us in this situation, as well as its attempts to divert and delay the social response with useless proposals like the demand for a referendum. The hard social situation demands a strong response, one which will grow and continue, which will break the ties with the political and economic system in which it originated, which it benefits and which is complicit with it. After months of hesitation, the CCOO and the UGT will call general strikes on November 14, dragged into it on the one hand, by increasing social unrest and mobilizations in the streets and on the other, by the continued anti-labor measures of a government at the service of financial elites and employers with no intention of conceding even the crumbs that allow institutional unionism to justify their role. 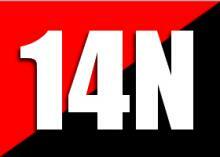 CNT has agreed to call a general strike for November 14 and we will do this in our own way, with our own demands. We say that this strike is necessary but is not sufficient and we call for it to go beyond the sterile and frustrating scenario of the institutional unions that people have become accustomed to. La ZSP (Sección Polaca) hicieron diferentes tipos de actividades informativas en apoyo a los trabajadores en huelga de España y Grecia, y llamando a la acción en Polonia. Se hicieron acciones informativas en varios lugares emblemáticos, como el Instituto Cervantes o la agencia de prensa principal, con la consiguiente difusión de cartelería y folletos, incluido en la embajada española. Por último una pequeña manifestación con pancartas por el centro de Varsovia. 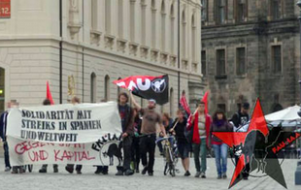 El Sindicato General de Dresde de la FAU-AIT (Alemania), se manifestó por la ciudad con banderas, pancartas y repartiendo folletos en protesta de los recortes sociales europeos y en apoyo a la Huelga general en el País Vasco y las movilizaciones llevadas a cabo por CNT. Se llevó a cabo de forma espontánea por Schlossplatz y el Nuevo Mercado de Albert Town Square y en el consulado español, leyendo un comunicado de apoyo en varios idiomas, incluido el español. 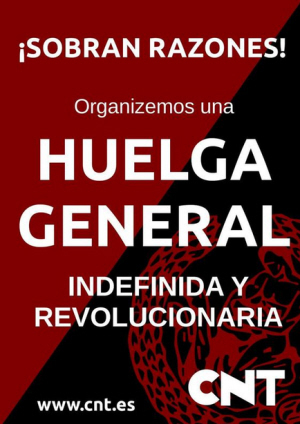 En el evento participaron, también sindicalistas de Halle y personas de la red libertaria Dresde. 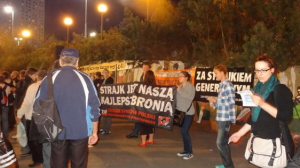 The ZSP held different informational actions in support of the striking workers in Spain and Greece and calling for action in Poland. It carried out informational actions is various symbolic places like the Cervantes Institute or the main press agency, putting up posters and handing out leaflets, including at the Spanish Embassy. At the end of the day it had a small demonstration in the center of Warsaw with banners. 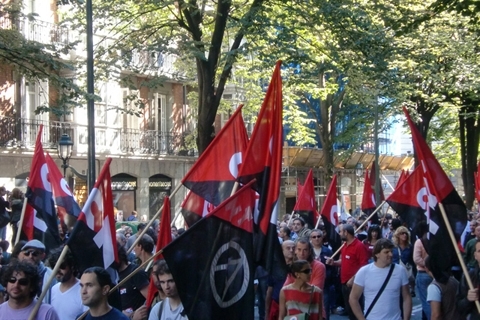 The General Union of FAU Dresden demonstrated in the city with flags and banners, giving out leaflets protesting the social cuts in Europe and in support of the General Strike in the Basque Country and the mobilizations organized by CNT. They went spontaneously from Schlossplatz and the New Market of Albert Town Square to the Spanish Consulate, with a comunique in different languages, including Spanish. Syndicalists from Halle and people from the Libertarian Network of Dresden also participated. Забастовочные пикеты, анархо-синдикалистские знамена, митинги... С раннего утра 26 сентября профсоюз CNT проводил выступления в различных городах Басконии. В Доностии (Сан-Себастьяне) члены Конфедерации принимали участие в утренних информационных стачечных пикетах. Из-за присутствия полиции имело место несколько напряженных моментов в торговых центрах ARCO Amara и Super Amara. Позднее колонна CNT присоединилась к главной утренней демонстрации. То же самое происходило в таких городах, как Бильбао, Гастейсе (Витории) и Ирунье (Памплоне). В последнем городе анархо-синдикалистская организация провела митинг, участники которого подвергли резкой критике нынешнюю социально-экономическую ситуацию и озвучили анархо-синдикалистский ответ на нее. После этого мероприятия, члены CNT прошли по улицам города и присоединились к общей профсоюзной манифестации, в ходе которой произошли нападения со стороны полиции. From the early morning on the 26th of September, the CNT protested in different cities on the Basque region. In Donostia (San Sebastian), members of the union took part in early morning informational pickets about the strike. There were some rough moments due to the presence of the police. The CNT later joined the main strike demonstrations. In the evening, they held their own demonstrations in Donostia, Bilbao, Gasteiz, and Irunea. 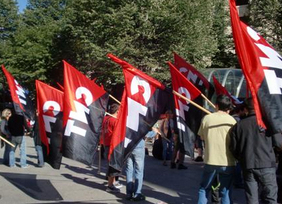 In Irunea the CNT organized a picket where they criticized the current socio-economic situation and gave anarchosyndicalist solutions for it. Activists from the CNT in Durangaldea took an active part in the strike, organizing many informational pickets.